WYOU Executive Director Barbara Bolan appeared last evening on Madison Tonight hosted by Brian Schimming on WIBA 1310 AM radio. Go here to listen to the entire program. WYOU gets big write-up in Cap Times! Capitol Times reporter Jane Burns gave us a lot of ink on today's front page! 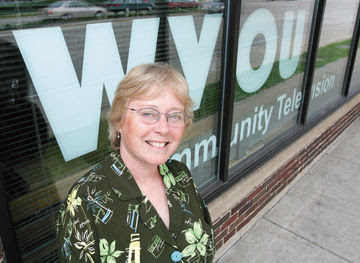 Read the entire article on WYOU, Exec Director Barbara Bolan, and our efforts to save the station. 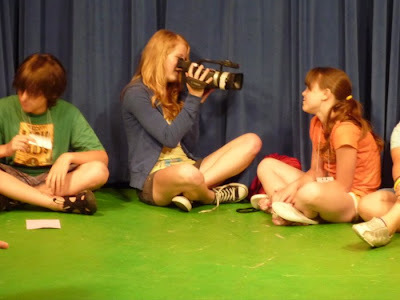 Another WYOU Summer Youth Film is on the Air! It's Zombies vs. Minions in this short film from the 2009 WYOU summer youth video camp (in conjunction with the Wisconsin Youth Company). 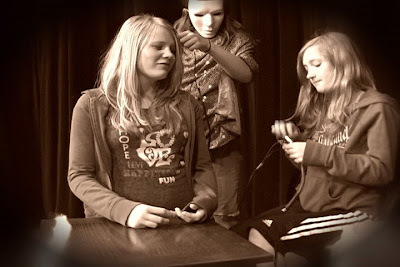 See the entire Showdown in the Haunted House! WYOU Summer Youth Camp starts off with a BANG! The 2009 WYOU Summer Youth Camp got off to a great start this past week with a group of middle school students from the Wisconsin Youth Company. 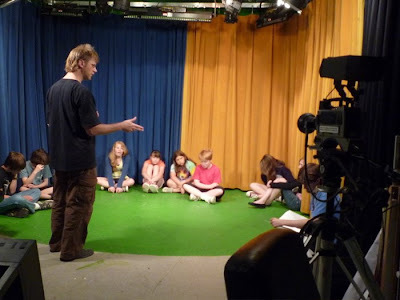 Each day, the kids came into the WYOU Studio to learn how to use digital video cameras, to write and produce short films and commercials, and to go live on real television. Each student went home at the end of the week with a DVD of the video work they'd accomplished. Watch a short faux commercial clip of their work. 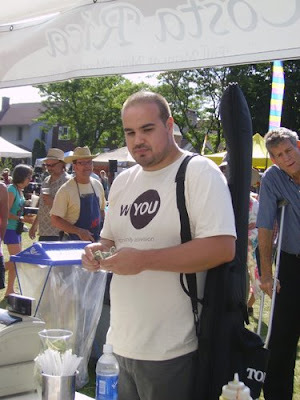 WYOU was at this year's Marquette Waterfront Music Festival. WYOU gets written up in a Jane Burns 77 Square article! 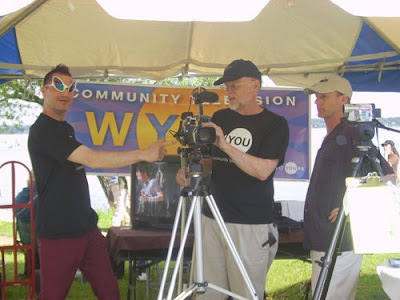 WYOU Community Television kicks off its Summer membership drive/fundraiser, “Hands On WYOU” on Monday June 8, 2009 with plans for on-site booth presence at two free music festival events in June and July, and culminates with a party at the High Noon Saloon on Sunday, July 12th. 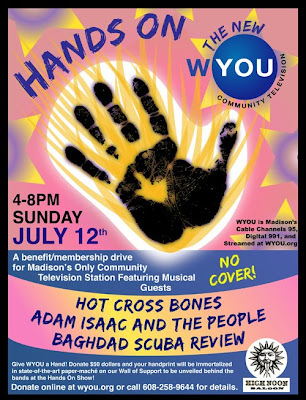 For donations of $50 or more, contributors can create a “Hands On” handprint in a form of papier maché that will be used to construct a WYOU Hands-On contribution wall to commemorate community support for Madison’s only public access television station. 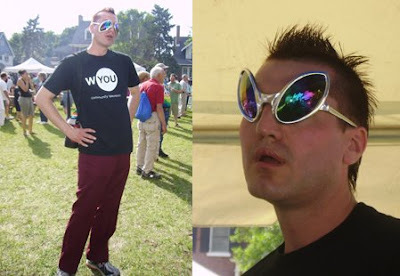 festival moments, life in Madison and testimonials supporting WYOU’s open community access. Hand prints collected throughout the fund drive will be fashioned into a Hands On WYOU support wall that will be used as the stage backdrop at the High Noon Saloon party. Collected stories will be edited into a series of vignettes that will air on WYOU throughout the summer and fall. information, program schedules, membership sign-up sheets and commemorative pint glasses will be available inside the venue as well as on the patio. Member/producers will be “on hand” to meet guests and answer questions about their shows. No cover will be charged at the door but donations are strongly encouraged. The party is open to adults, 21 and over, and children under 18 with supervision. The High Noon Saloon is located at 701A E.Washington Ave.
WYOU provides an extraordinary range of locally produced programming from music and travel shows to in-depth interviews, church services, politics, educational programming, feature-length films and much more without commercial interruption 24 hours a day, seven days a week. 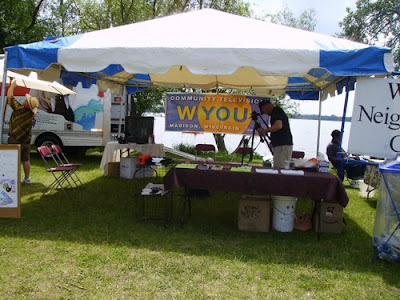 Information on the station, its programs and how to donate is available at www.wyou.org or call 608-258-9644. WYOU is cablecast via Charter Communications in the greater Dane County area on analog Channel 95 and digital Channel 991. Charter describes WYOU’s potential audience reach as 200,000 households. Since March, 2009 WYOU is now streaming 24/7 live at www.wyou.org. Give WYOU a hand! Donate $50 and your handprint will be immortalized in state-of-the-art paper-mache on our real and virtual display ‘Wall of Support,’ displayed at the Hands-On July event. Donate online at www.wyou.org or call 608-258-9644 for details. In true WYOU fashion, the High Noon Saloon event on July 12 th will be creative, multi-faceted and full of life. You will see a meet and greet walking TV welcoming you into a variety of booths from WYOU show producers and local area businesses. The main event will feature an on-stage line-up to include Baghdad Scuba Review ( www.baghdadscubareview.com ), Adam Isaac and the People ( www. myspace.com / adamIsaacandthepeople music ), and trombone band, Hot Cross Bones ( www.hotcrossbones.com ). Pioneering video creations can be sampled around the venue to pique your eye’s interest, with an original WYOU comedy sketch show from the 1970’s, the latest special feature shows on-air, and on-site video remixing and projection. The Hands-On House Party will be streaming live on-air and on-line as well. 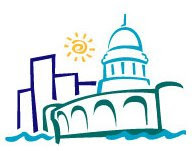 * Contributing $50 to the Summer Hands-On Fundraiser Drive to immortalize your support in a creative hand-tile, to be created at WYOU, 609 E. Washington St., contact 608-258-9644 to sign-up. OR Get Involved by becoming a member, intern or volunteer! What Does WYOU Mean to You? We need WYOU to stay active and healthy in its mission. I see the true mission of community access televeision to be to enhance and promote community interests and awareness. One thing which is highly valuable about WYOU and community television nation-wide is the force to serve as an incubator for alternative voices, as well as to counteract the corporate saturation of mainstream media voices, which by inherent nature, has particular interests guiding its content. Not being encumbered by the strict rules of profit methods means being able to air shows that are important for the community, but have not developed enough, or do not hold the financial backing, to reach the attention of the corporate world, but still deserve to be aired and feed the communities' needs for a healthy future. Such shows as West African Experience, En Vivo, Madison Progressive Voices and other alternative shows give voice to the various members of the Madison Community in the media, where there are no other current local outlets. Undoubtedly, these shows contribute to the health of the local community and provide an interaction between diverse populations within the area. While WYOU, has been around a long time, its potential to be a fully developed avenue for community voices has still yet to be realized. In part, this situation is due to the need for an impetus to move forward, better organizational capabilities (which require additional community funding support, that's you!) and a vote of support for including community voices to the media elements of our individual lives. Make your voice heard! Make It Yours! The NEW WYOU!